Our first mailbag for August takes a look at some of the best moves made this summer, cap-clearing ideas in Pittsburgh and St. Louis, questions on the back end for Toronto and Winnipeg, and expected expansion in Seattle. DaBinx: What’s been the best contract handed out this offseason? Best trade? Out of the unrestricted free agents, I’m going to pick one of the smaller deals handed out. Dan Hamhuis isn’t a top pairing player anymore but he’s still capable of playing in the top four when needed and help on the penalty kill. For Nashville to get him for $1.25MM per year is a fantastic move. He’ll stabilize their third pairing and provide some quality injury insurance for a minimal cost. In terms of a more notable signing, David Perron’s return to St. Louis (four years, $16MM) was a very good one. He’s not going to repeat his 2017-18 numbers but at a $4MM cap hit, he doesn’t need to. If he can be a good second liner (or even a great third liner), the Blues will get good value here. Assuming he stays healthy, Perron’s a safe bet to accomplish that. As for the best RFA contract, I’m again going to Nashville with goaltender Juuse Saros (three years, $1.5MM). That’s well below the market value for a quality backup ($2.5MM – $3MM that we’ve seen in free agency) and with Pekka Rinne set to potentially become a UFA next summer, this deal gives them a potential number one at a very cheap price. On the trade front, I really liked San Jose’s moves with Mike Hoffman. The fact that they were able to get out of the final two years of Mikkel Boedker’s deal was impressive as was their follow-up swap that landed them a trio of draft picks. They essentially managed to get good value for a player that a lot of people would have suggested had next to no value at all. They still have plenty of cap space to work with for the upcoming season so the full benefit of their movement here has yet to be felt. An honorable mention goes to Buffalo in the Jeff Skinner deal. They added a legitimate top-six forward for a lot of spare parts. If the Sabres work their way towards a playoff spot, it’s a win for them. If they don’t, they should be able to recoup most of what they gave up (if not more) come the trade deadline which also makes it a win for them. This is as close to a no-risk proposition as you can get when adding a core player. Paul Heyman: What would a Bouwmeester and/or Gunnarsson trade get the Blues aside from salary relief to re-sign Jordan Schmaltz? To be honest, probably not a whole lot. With the year Carl Gunnarsson had (one that saw him scratched at times), his value isn’t going to be more than a mid-round pick at this point. They’d probably get better value if they tried to a do a player-for-player swap but that wouldn’t yield the cap savings you’re looking for. As for Jay Bouwmeester, I don’t think there’s any real market out there for him. He missed so much time last season with various injuries (including the hip problem that ended his campaign prematurely) that teams are going to want to see him play for a while to make sure he’s fully healthy before giving up anything of value. His $5.4MM cap hit doesn’t help either, nor does his full no-trade clause. If they want to move him now, the return would be very underwhelming. Having said all this, I don’t think St. Louis needs to necessarily deal either of them. They have a surplus of forwards that they can waive and cut (Chris Thorburn and Jordan Nolan come to mind) to free up more than enough room to keep Schmaltz. Coming off of his entry-level deal with minimal NHL experience under his belt, Schmaltz doesn’t have the leverage to really command much more than his qualifying offer. Going this way would see them once again heading into the year with minimal cap room but it would put them in a situation where they may be able to hold out for a bit more value if they do want to deal someone for cap space as by then, some teams will be dealing with injuries and will be looking for capable replacements. ThePriceWasRight: Fantasy GM time. If you are Dubas, and your goal is to lock up Nylander, Marner and Matthews long term, how or what do you do to address the D? 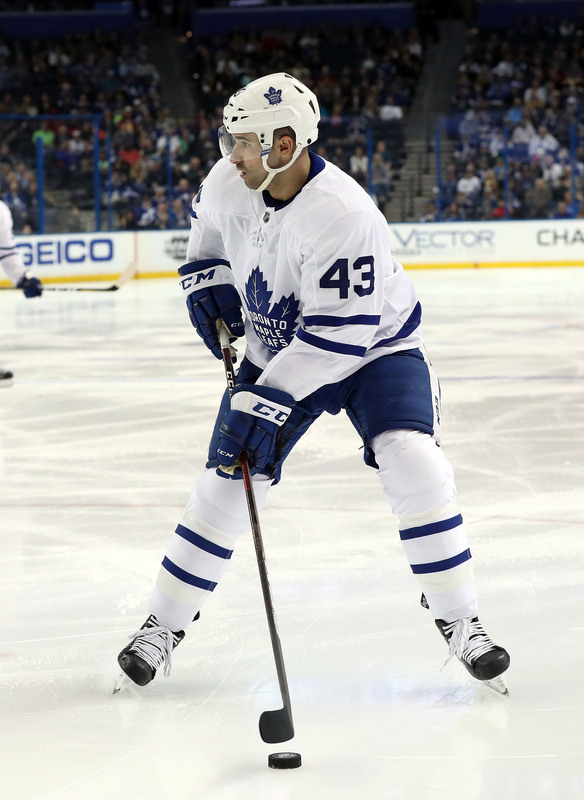 Could Nazem Kadri or Jake Gardiner be considered trade bait? Kadri has quietly been one of the more productive centers in the league the last couple of years when it comes to goal scoring. While it’s certainly difficult to move on from that, I’d have to put him in the trade category. With John Tavares locked up long-term and Auston Matthews soon to be, Kadri is now going to be no more than a third liner for the rest of his contract (which last four more years). That’s a fantastic luxury to have but is that the best use of an asset like that? With the demand for quality help down the middle being as high as it is, the Leafs should be able to land a core defenseman either signed or under team control for several more years for him. That leaves them a little thin at center but short-term, Patrick Marleau can play there in a pinch and it’s a lot easier to land a third line pivot than a core defender so it’s a risk I’d be willing to take if I was Kyle Dubas. From the standpoint of not letting a core piece go for nothing, the temptation is there to move Gardiner but at the same time, they’re also trying to go deep in the playoffs next year. Unless they can get a top-four blueliner in return, it’d be tough to move Gardiner as losing him would really hurt their back end. Toronto has a surplus of quality young forwards that are either set to make an impact this season or will be knocking on the door soon. I’d be looking to deal one of those with one of their defensive prospects in exchange for a better young defender that’s close to being NHL ready and try to upgrade their depth that way. They’re going to need cheaper defenders to offset the big salaries up front so positioning their back end to be on cheap entry-level deals as their big-ticket contracts kick in will be critical. They’re not going to be able to have an elite and established defense corps so going young with upside to accompany the likes of Timothy Liljegren and Rasmus Sandin will be the way to go. Zack35: Jacob Trouba has two more years of playing before he becomes a UFA. Do you see the Jets trading him before that point or would they keep him as own rental because they’re trying to win? Six weeks ago, I’d have guessed that Winnipeg and Trouba would get a long-term deal worked out and that the contract questions would be behind him. Not anymore. Given what transpired here, I can see Trouba’s agent (Kurt Overhardt) simply advising Trouba to go through the hearing again next year and hitting the open market in 2020 unless Winnipeg is willing to make him one of the top-paid blueliners in the league. To answer the question, I think Winnipeg needs to know what’s going to happen with Tyler Myers first. They can afford to lock one of them up long-term but not both. If they can reach a new deal with him, then Trouba becomes expendable. If not, they probably have to hold onto him and hope that they can agree to terms. Let’s assume they can get something done with Myers which makes Trouba more expendable. I have a hard time thinking they’d move him in 2018-19 because of their competitive window – they should contend once again. I’d peg June of 2019 as the likeliest time for him to move – the acquiring team not only would get him for a full season but also would have some time to work out a long-term deal, something that wouldn’t be the case if they wait until July or later. Regardless, the questions about his future with the Jets are certainly going to continue next season. grizzled sports vet: What kind of market/return would there be for Kris Letang if the Penguins would think of trading him? I’m wondering if they would entertain the thought at some point because they are near the cap ceiling. The idea that Pittsburgh could consider dealing Letang has been floated around for a little while now. However, it’s a notion that sounds better in theory more than in practicality. For starters, the injury questions are going to be there no matter what. He has already had three diagnosed concussions which may make other teams skittish not to mention the heart ailment that cost him 26 games in 2014. Last season was one of the rare occasions where he didn’t miss significant action due to some sort of injury. Missing time that consistently doesn’t help his value. Then there’s his contract – four years left at a $7.25MM cap hit. That’s big money for someone who misses as much time as he does not to mention the fact that he isn’t the most conscientious defender. There’s no denying that Letang is a high-end offensive player (and should be for several more years) but these elements don’t help his value either. From Pittsburgh’s standpoint, it’s not as if the team has players that are showing they’re ready for more playing time that could push Letang out. Their back end isn’t viewed as particularly strong and losing him will only make it worse. Most teams don’t have the type of money to bring Letang in without sending a high-priced contract in return which defeats the purpose of dealing him for cap room. Between that and the other factors, it would probably be a pretty soft market for Letang to the point where it wouldn’t make sense for him to be dealt. If they want to free up some extra cap room, I’d toss out Justin Schultz as the candidate that would make some sense to move from their back end. With only two years left on his contract (at $5.5MM per year), that’s not as big of an outlay for someone to add so there may be more of a market to work with. Carl Hagelin’s $4MM deal is up at the end of the year and he’d make sense to move as well, especially if they actually intend to try Derick Brassard on the left wing. They’re shorter-term fixes on the cap than Letang would be but it would still give them some extra flexibility to work with for next season. Connorsoxfan: What effect could the looming work stoppage have on the Seattle expansion team? Would it impact their beginning operations at all? Could the players leverage it saying a lockout in their inaugural season is a PR disaster for the league? Given that, would the league consider expediting/delaying the expansion process accordingly? I don’t think the expected Seattle expansion will have any impact on CBA talks. The league has clearly demonstrated that it’s not concerned with the negative publicity that comes from a lockout so it’s not something that the NHLPA could leverage in CBA talks. If their inaugural season happens to be during a work stoppage, so be it. Fans of 31 other teams are going to be just as disappointed as well. I doubt the league will either quicken or delay the expansion process with the CBA in mind. They’ll proceed with business as usual until the day the CBA expires. Otherwise, they could tip their hand publicly when it comes to their expectations of yet another shutdown and that’s something they won’t want to do. It would be particularly unfortunate for Seattle as there’s nothing like a lockout to curtail any positive momentum and enthusiasm for a new franchise but it shouldn’t significantly impact their hockey operations relative to other teams. The ticket drive will long be complete and the team will have been picked so if another CBA squabble is on the horizon, they’ll be sitting back in eager anticipation for a resolution like the rest of us will. Thanks for Brian for answering my question. I do agree that one of Chris thorburn or Jordan Nolan could be cut.